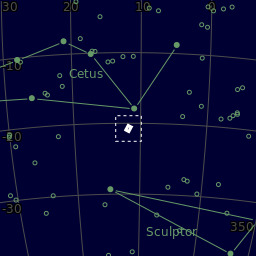 NGC 247 is an intermediate spiral Galaxy located in the constellation Cetus. It is a member of the Sculptor group located approximately 11.1 million light years away. The most striking feature of this Galaxy is the void. It contains stars that are different from those around. They are older, redder in colour, and much fainter. This suggests that the star formation within the void has been arrested, and slowed a billion years ago. We are still unsure how the void has formed. Recent studies suggest that it might have been formed by gravitational interactions with another galaxy, or even a recent interaction with a nearly dark subhalo that collided with the disc. The centre of the Galaxy is visible as a bright patch surrounded by a mixture of stars, gas, and dust. Silhouetted against the background of stars the dust and gas have formed interesting filaments. The best month for viewing NGC 247 is in November when it is at its highest altitude. It has an apparent magnitude of 9.9, and an apparent size of 21'.4 × 6'.9. I like to think that most photos contain an interesting trinket. At first, I thought that I had a wacky artifact. After further research, the smudge was indeed real. Look to the top right-hand side of the photo and locate the two galaxies like structures with a milky trail connecting the two. The smallest is MCG-4-3-12 at Mag 17, less than 0.5' in size. Its classification is "unknown". The larger is a galaxy, ESO 540-23 SBb, Mag 14.46, 1' X 0.39'. I did find some images from much larger telescopes than my instrument confirming what appears to be a bridge of material appearing to connect to two objects. That’s pretty wild stuff. I can only imagine what happened to create such an incredible formation. Center (Dec, dms):	-20° 43' 59.305"